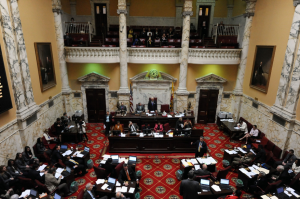 The beginning of every legislative session brings change, but few changes are as clear and pronounced as those occurring in the Maryland Senate Democratic Caucus. As a result of the 2018 elections, the ranks of the 32-member Senate caucus are markedly different and include 14 newly-elected Senators poised to make an instant impact for their constituencies. These ranks are now made up of members representing a broad cross-section of Marylanders and include leadership changes to nearly every standing committee. This new diversity in both membership and leadership has created a palpable energy and a clear sense of enthusiasm in the body for the 2019 legislative session. Of the new caucus members, Baltimore City (Carter, Hayes, McCray, and Washington) leads the way with four new resident members and is followed closely by Prince George’s County (Augustine, Griffith, and Patterson) which boasts three new members. Anne Arundel County (Beidle and Elfreth), Howard County (Lam and Hester), and Montgomery County (Kramer and Waldstreicher) each have two new resident members while Charles County (Ellis) sends a single new member to Annapolis. In addition to the membership changes, a markedly different committee leadership structure has been put in place including a diversity in roles of authority not seen before in the body. Four of five standing committees will be led by first-time chairs including the Budget and Taxation Committee (Senator Nancy King), the Finance Committee (Senator Delores Kelley), the Education, Health and Environmental Affairs Committee (Senator Paul Pinsky), and the Rules Committee (Senator Joanne Benson). While a great deal of change is taking place, one constant remains in the steady leadership of long-time Senate President Thomas V. Mike Miller, Jr. (District 27 – Prince George’s, Charles, and Calvert). First elected to the Maryland Senate in 1974, Miller has served as Senate President since 1987. He holds the distinction of not only serving as the longest serving Senate President in the history of the State of Maryland, but also as the longest serving State Senate President in the history of the United States.